The following story is part of Flash Fiction Chain # 5 hosted at the wonderful Photrablogger. The chain is inspired by the photograph above which is just one of the bunch of amazing photos and posts about travel, photography and life on the blog. Part 1 has been written by Abirami. Please read it to understand how the story progresses. Rick was a surprised boy. The monkey sat on one of the low branches. Rick looked up curiously, cautiously. Mrs. Montgomery never did mention any monkeys around here. Macaws, yes and mockingbirds. This was good, this was fun. Rick swung his arm with the banana in his hand. The monkey chattered for a while and in one swoop took the banana from his hand. Rick nearly cried out for the touch was as if an electric current had passed into his body. Now, how did he know electric currents? Jake, ma’s (for that was what all the children called Mrs. Montgomery) real son, had once set up some wires across the field. Two boys tripped over them-and there were such a hell lot of them in the house ma kept- and got some nasty burns. Rick was one of those boys and it made him swear revenge. Jenna saw his burn on one of her visits and her eyes were oh so round! But Rick lied about it. Jenna had been a rock in his short and troubled life. Going beyond the duties of a social worker, she was maternal and caring. Rick almost lied about ma too. He did not want Jenna to know how much he had come to like ma. “Wouldn’t Jenna be jealous?”, mused Rick as he practiced skipping stones on the surface of the muddy still pond behind the dingy house. Soon, the sun was overhead and Rick felt drowsy. He sat in the shade of one of the nearly bare trees. To get the scanty shade, he twisted his legs around a dried, fallen branch. Sometime, this piece of wood too would be taken away for burning in the kitchen. The memory of the kitchen smoke started his eyes smarting. His eyes were always red these days. And watery. One of the boys in his room-there were only two rooms for the boys-hit him with the enamel jug used for washing themselves in the basin and called him a devil. Rick had felt the anger rising in him but he stayed quiet for he saw Jake looking on. He could not risk a fight and be ratted upon. Under the tree, Rick felt a soft touch on his head. He stirred sleepily. He felt something moist put into his hand. Reluctantly, he opened his eyes and squinted against the afternoon sun. A banana peel! He bolted upright. As the leaves rustled overhead, Rick shouted. For there was the monkey again! Returning the banana peel! 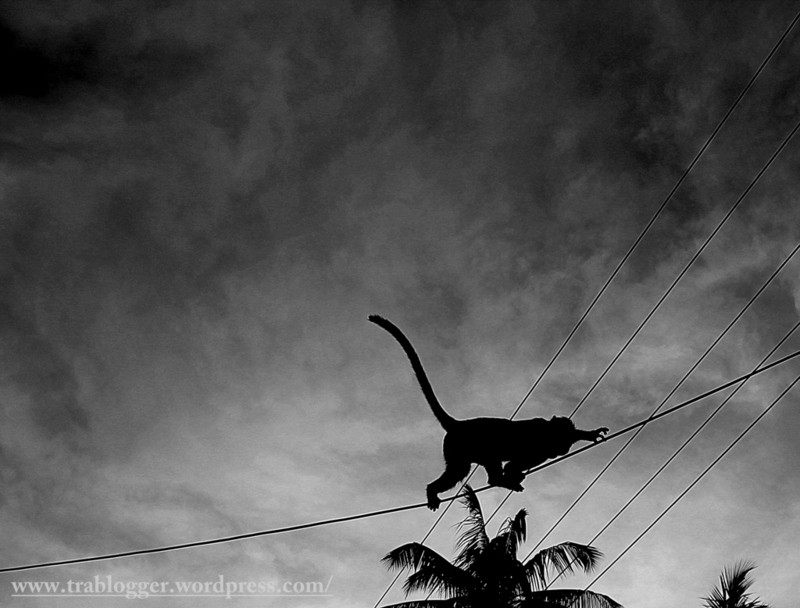 The monkey playfully swung from one branch to another and perched on one of the higher branches on the tree across. Rick looked at the monkey for some time. For a boy who was only interested in books and the make believe world, Rick spent a long time peeping at the monkey through his half closed eyes. Ma rounded up all the children soon after. They were to wash up before the evening meal. As the boys sat down on the hard floor in rows, Jake and Ben took turns to pour the thin gruel into the boys’ soup bowls. Rick sloshed about the gruel in his bowl. There was a loud screech from the yard and a flurry of screams from the boys sitting near the window. A hazy brown shape came in and kicked over Jake’s bowl. And then it was gone. “Just a wild monkey, children”, ma tried to soothe the boys. But Rick smirked. The monkey was an ally. It had taken his revenge on Jake. Before getting in the bed that night, Rick crept to the barn outside where fruit and vegetables were kept. He hid a small bunch of bananas under his shirt. Rick then walked in to ma’s room to kiss her goodnight and to get an eyeful of the whimpering Jake. He got in the bed with the bulging bunch under his shirt. “Tomorrow, the monkey shall be given good food. What a soldier! Coming to my rescue”. The moon was as bright as a round, clean tin plate. It peeped in the open window of Rick’s room. Shadows of the leaves danced on his face. He rubbed at his itchy eyes in his sleep. He felt, rather than heard the booming voice. “Give me the bananas”. Rick’s red eyes flew open and there was a rounded shape at the end of his bed. A soft furry hand reached under his shirt and pulled out his bunch! Rick screamed but no voice came from his dry throat! He watched in amazement as his soldier peeled the fruit one by one and devoured it. “It gets mighty difficult to get something to eat in this dry bush. Too little water in the rivers to make the land green and fertile”, said the booming voice. “You don’t read many books, do you?”, said the monkey. “Oh, I do. Nobody can read as well as I can here. Ma makes us study for two hours in the morning but I alone read for four, five hours”, said Rick proudly. “Hmm.. but you still do not know enough. I shall have to teach you myself”, said the monkey in that booming voice of his. Rick looked around nervously to see if anybody else was awake by their conversation but amazingly, everybody slept on. “A talking monkey“, thought Rick incredulously. Was he really talking to a monkey? Was he going bonkers or was this just a dream?? Thank you. I wanted the story to be child friendly. I almost started to talk in the voice of a ten year old. Then, decided to go slow. Build some background and atmosphere and let the ones coming after do their job. Anyway, thanks for the theme in this chain. Loved it. I rather wanted to start writing for children. This is a good kickstart. This is pretty much how I wished the story would go! Great job. I love how you’ve included the foster mom character into the exchanges as well. 🙂 I have a feeling this only gets better and better. Thank you. I am curious about how the boy-monkey friendship develops now. Wow..Sona..how do you always do it ..?? You captured the emotions of the little boy so well and I loved your expressions and metaphors too..like the moon being a round ,clean tin plate ! This one is going to be a little difficult for me , firstly because I have never written anything for kids before ,(there is so much to think off , the language ,the emotions , the immature outlook towards things …) ,secondly , I have to live up to the standards stet by all of you and thirdly , I have to end the story , which again is a difficult thing to do , weaving everything up together ! Thank you so much, Sweety for reading my piece closely and being so lavish with your praise. I tried to have the voice of a ten year old and went around thinking like that for a couple of hours before i sat down to write. I got around to talking like a ten year old Rick from the tin plate metaphor. Till that time, i was only building the background for the boy-monkey friendship. I think that is where the fantasy element can be worked in. At present, i am happy writing from a 5 year old perspective, derived from the stories i tell my children at bedtime. Thank you so much! I am glad you enjoyed the story. I myself find it fun to be part of a flash fiction chain. I look forward to how the story would be developed by other brilliant writers in the chain. Why someday? If you enjoy reading and writing so much, you can be a part of this chain. You can get the monkey to say and do whatever you want to. Check out this link and leave a message in the comments section expressing your interest. This was awesome! My goodness we are already off and running here I think. The plot and character development was just great and as always the best sign of success was that it was fun to read. I think these chains are something special. Thanks for making that so. It is so much fun to write something like this 🙂 i am inspired by all of you out there! Yeah I think this method is really interesting. One it merges writer-audience, giving both sides a chance to speak and listen. You’re automatically engaged in the story as a participant, since you need to pay attention, but also like you indicate you see others great efforts and it pushes you to try harder. Wow! You have put concisely into words what we all have been experiencing all along. I love the idea that this could become a concept of sharing literature. I think this explains the popularity of folk tales. Ah your folk talk point is brilliant! That’s exactly it. In India, we have Ramlila, which is the retelling of the epic Ramayana in a drama form. You cannot believe the excitement generated by this folk form which is performed once a year. The reasons for its popularity are: the cast is drawn from the local area, the local areas are responsible for the entire management and the audience actively participates in the actual performance breaking out in impromptu singing, dancing and talent show. So, during Dussehra festival, we have Ramlila performed in thousands of hamlets and towns all over the country. That is freaking awesome! Thank you for sharing. I was just talking to my wife about this, have you seen in your festival any like real world implications played out through story and drama? LIke marriage/love interest type things or even business and rivalry situations? That’s my hypothesis, that in these creative forms, a lot of real world issues could possibly be resolved? Got hots for a particular beauty, write a really romantic monologue and woo away! Ever seen anything like that? I would love to be witness of a resolution of a real life problem. Yes, it is a possibility and I am sure there have been instances of this happening. I wish i could quote an incident…. All good, yeah I did a little research on the subject and its just sounds awesome. Such a rich narrative and symbolic tradition! Its hard as an outsider to really digest everything. Not to go off on another jag here, but from my very brief and amateurish study of Indian mythology there seems to be just a different vibe to a lot of the art and stories I encounter. To me it seems a difference between left brain (logical/rational) and right brain (imaginative/intuitive) thinking. Its also interesting that so much is made of of the “Western” folk tradition i.e. Homer, Shakespeare, etc. while in India you just have this massive and intricate cultural tradition of storytelling, which somehow gets lets attention. That’s another thing I was sad to learn is that some of the cultural traditions are being abandoned by current generations, who are more engaged with modern attractions and entertainments. This is such a shame if it is true! Unfortunately, and this is just my uneducated opinion, but I wonder if that is because in the West we are so disconnected from a right brain way of thinking, that we can’t even process India’s rich mythologies? Do you have any recommendations for an introduction to these mythologies or histories/studies of the subject? Or any editions which are good reading for a newcomer? Also I just had a thought, not so much a resolution to real life problems, but a great literary example of a book being in direct conversation with real life issues I think would be one of my favorites, Harper Lee’s To Kill a Mockingbird. Or even something like Uncle Tomb’s cabin. But again those aren’t the best examples of a folk, oral tradition, like we were discussing. You know this would actually be the basis for a great story! Set it a hundred years or so in the past, during a Ramlila festival, and have the protagonist trying to gain the attention of his love interest with his theatrical prowess. Could be a load of fun! Lots of hugs, James. May you be better soon. Your spirit’s voice is lovely. I think you are very very strong in continuing to write and caring for others. I can see your concern and appreciation for others even when your body needs healing. You continue to inspire us and not just by your writing. Hi, I am Rashmi and was given the opportunity to write part 9 of this story. I really liked the innocence of your part and it was so enjoyable to read but the story changed a bit till it reached part 8. I tried to add some thrill and drama in children’s lives. Thank you so much! I am honoured! Hats off to the style of writing !! Thank you! Your appreciation means a lot to me! Amazingly written.cannot wait to read the end.The little boy captures the heart with his thoughts. Please go on and read all the parts. You would love the conclusion!